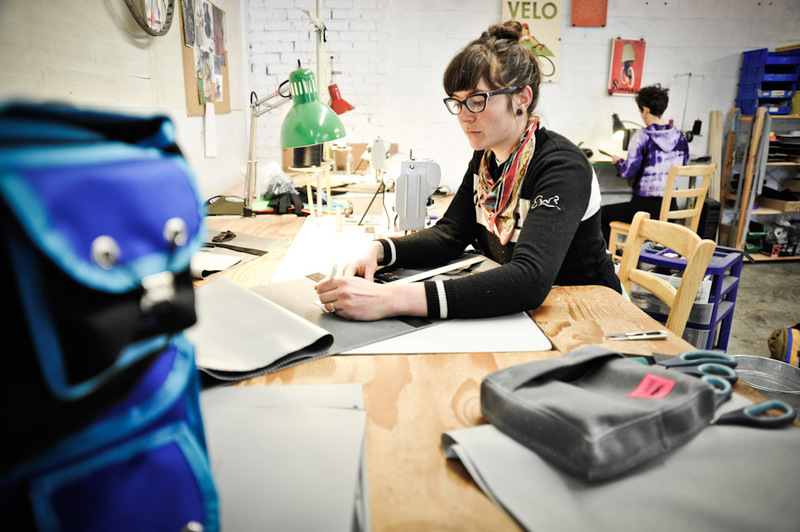 Martina Brimmer is the force behind Seattle-based pannier and bag company Swift Industries. She’s also a dedicated bike tourist, adventurer, writer (she is a co-contributor, along with me, to the forthcoming bike touring guide Cycling Sojourner Washington), teacher and more. She and her partner, Jason Goodman, launched Swift Industries out of their home in 2008. It’s now a full-fledged business with full time employees and customers worldwide. I sat down with Martina in the Swift studio to talk about the challenges, successes, and growth of the company, her bike adventuring, her literary project Tough and Tender, and much more. Let’s start with the business side of things. Tell me how Swift Industries began. Swift launched in 2008. But, the story starts a long time before that, I guess. I had been introduced to bicycle touring three or four years prior and I was really excited about it. Jason and I started touring a lot more. I was working for R.E.Load bags here in Seattle at the time, so I had access to an industrial sewing machine and some of the supplies I needed. I did not have the equipment I needed, however, so I just made it. Friends saw my panniers. Then friends of friends saw my panniers. We were encouraged to put up a blog site. And that’s kind of how Swift was born. It became a much more intentional effort when we realized R.E.Load was leaving Seattle. I knew that I wanted to continue sewing. I had fallen very, very in love with sewing for a living. And it was really fantastic to design bicycle gear beyond messenger bags. The design process was really compelling and I was growing a lot from that process. So it was a very natural thing to focus on panniers and all of the subsequent models that have followed. How did you end up working for R.E.Load in the first place? Did you have industrial sewing experience? I grew up doing a lot of textile arts at home. Everything from knitting to weaving to sewing. I did not have any formal education in textiles, sewing, design, manufacturing. But had a really rich history of that from my childhood. When I walked into R.E.Load they took a gamble on me, for sure. But they liked the experience I had and likely took note of the fact that I was a dedicated cyclist already. So Ellie took me on board and that’s where I learned to sew industrially. That would’ve been around 2003 or 2004 and you say you were already a dedicated cyclist. When and how did you get into riding bikes? I got into biking around 2002. I was in college at Humboldt State and becoming much more interested and aware of environmental issues. And I was broke. So I pulled out my bicycle from my mom’s basement and started commuting for the first time. I really saw it as transportation. It was rare that I would hop on my bike just cause. It was to get groceries or get to and from places. Then I did my first tour, from Arcata, California to San Francisco. It was incredibly empowering for me to travel at that really palatable pace. And to do it by my own means. I had never really been exposed to that sort of thing at the time. I hadn’t been backpacking yet or anything like that. That introduction was pretty eye opening. These days you’re a very accomplished bike tourist. You’re getting ready to do the 360-mile Oregon Outback race this spring. You’ve clearly grown a lot as a cyclist since that first tour. Was it a natural progression or was there some conscious decision to try and push yourself? Since finishing that tour, I don’t think there have been more than 10 days away from a bicycle. Actually that’s not true, I lived in Bolivia for a time and didn’t have a bike. But cycling completely saturated my life. At that point it was not only something I could use as an environmental tool. It became a really big part of my social life. There was a lot of room for social activism through bikes as well. I was involved in a lot of co-ops and organizations that were looking to provide free or low cost transportation to undocumented immigrants and women and people who didn’t have access to a whole lot of resources. In that organizing capacity I found a really amazing community of people and notably people who were really self-sufficient by nature of being attracted to bicycles. I met people who worked on their own bikes and wanted to help other people learn to work on their own bikes. It’s really striking to me now, being exposed to a larger bicycling community, how many people don’t work on their own bikes. I feel fortunate that I was exposed really early on to that self sufficiency. It’s an overused word, but all of it was really empowering for me. Tell me about your favorite tour or bicycle adventure you’ve been on. 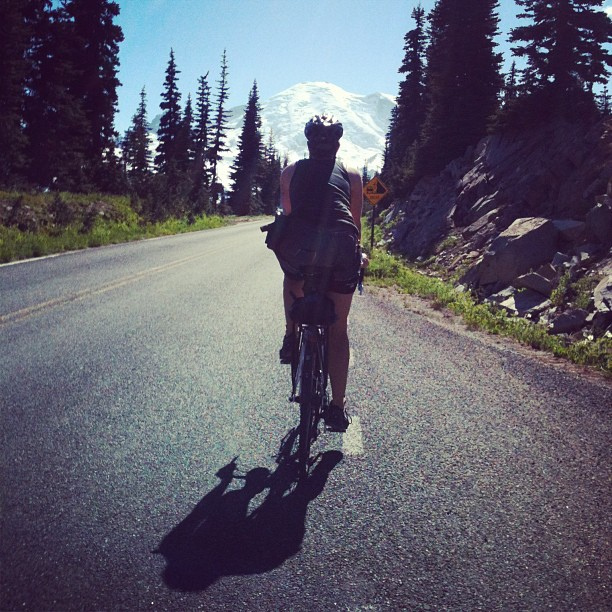 Last summer, my girlfriend Ellie and I circumnavigated Mount Rainier. I’ve gone far longer distances and I’ve gone to all kinds of places, but that tour was absolutely amazing. We left from Seattle, headed to Tacoma. Then we got this incredible, 360-degree profile of an amazing mountain on our ride through Gifford Pinchot National Forest. And she kicked our asses. There was a lot of elevation gain and loss. But it was stunning to be on the flanks of Rainier for six days. We got to enjoy rivers and glimpses of lakes and peaks and wildlife and it was just the two of us feeling pretty awesome about ourselves. The tours that I’ve enjoyed the most have been the ones I’ve done in the Cascade region. There’s a lot to explore here. Riding towards Rainier. Photo by Martina. In the vein of empowerment and bicycling as a tool for social activism, what is your side project Tough and Tender? We just finished off the third year of Tough and Tender. Tough and Tender is a literary and photographic project for women identified people to participate in. We love the touring scene and the touring community and it reflects the broader bicycling demographic very well. It’s very male; it’s usually guys out and about riding. But there are incredible women adventuring too. We wanted to provide them the opportunity to tell their stories about touring or whatever cycling they’re doing. It’s so rare we hear about women’s cycling beyond pink bikes. And to each their own. I think the Cycle Chic thing is a really great impulse within the cycling community. But it’s not one I’m all that interested in. I don’t want to be treated like a different kind of cyclist. My guy friends and I ultimately yearn for the same experience and tend to look for the same routes and tools and gear. I’m not the kind of person who feels inhibited by an inability to ride in high heels. We had an audience that’s growing through Swift and the culture of this company. 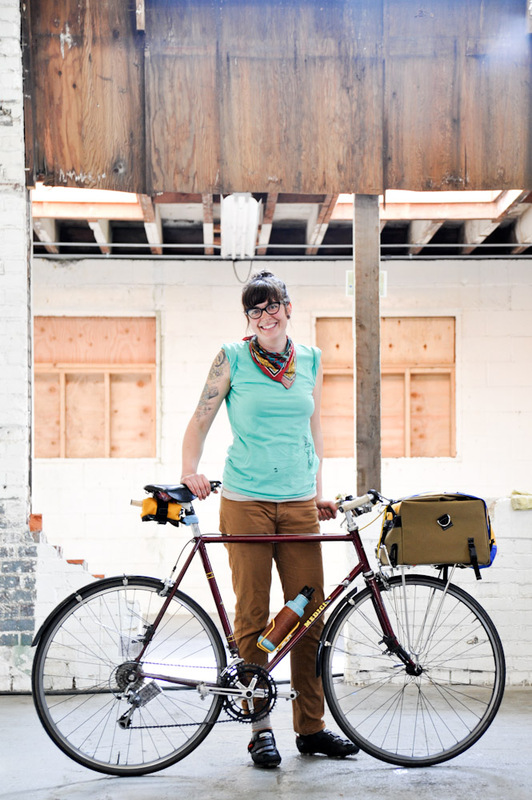 We are a company that’s predominantly women who ride our bikes. It was very exciting and natural to harness that audience and create a place for people to tell stories. What has the reception been so far in terms of contributors and readers? It’s been great. The first year we got 20 or so contributions. The year before last, we got about 60, which was really exciting for us. This year, with the help of Bicycle Times magazine we got about 75 contributions. We picked three stories from those and they’re being published in Bicycle Times and we’re running the rest throughout the winter to keep people inspired. We got a really lovely diversity of contributions that also speak to our various audiences as a company. We got folks that are really dedicated commuters. Folks that are utilizing the bicycle for transportation. Then a lot of stories of people who are touring and adventuring by bicycle. Swift has grown from you and Jason working out of your house to working in a studio space with a number of employees. How did you get to where you are now and where do you hope to go with Swift in the future? We started off blissfully naive about the complexities of running a business. And that was perfect for the time. I was employed at a local school as well and had a really flexible schedule. That afforded me financial independence from Swift at the beginning. And it made it possible to be a little more nonchalant about starting Swift. We worked out of our house for two and a half years. At that point, there was a really significant jump for us. It became really clear that we needed more space and help and those things happened in one fell swoop. It felt like a major milestone at the time. It was pretty serendipitous how we ended up with our first employee and our studio space and it was affirming to feel like we were on the right track. As the word continues to get out, we’re on a very steady trend upwards as a company. Upwards in terms of how many people have heard of us, in terms of how people use our gear in all different ways. And certainly that’s reflected in the quantity of orders that are coming in. It’s exciting and it’s always challenging. One of those challenges has been keeping up with demand as a small company. Scale is really complex. We’re taking this very slowly in order to maintain in-house production, that’s very vital to us. But it means we need to pace ourselves. If we don’t, we’re here until 10 each night, seven days a week. We have a very tangible carrying capacity. I think corporations don’t have that, by nature of separating all of the work out and sending it to a bunch of different facilities that each work on one aspect of the business. We field all of that here. It’s part of why we do it. Sourcing materials at our scale is so hard. To get the kinds of margins that make a company truly profitable is nearly impossible for a company at our scale. A company like Rickshaw bags is likely ordering 50-200 rolls of one single color of fabric and getting a nice break on that. We need to bring in two rolls of a color at a time. So the margins are really different. I’d never really been in a retail environment or a managerial position, but here I am in charge of a growing company. It’s a very welcome challenge, but there’s never a down moment. This entry was posted in Advocacy, Bike Industry, Bike Touring, Interviews and tagged adventures by bike, bike touring, custom bike bags, custom panniers, martina brimmer, swift industries, tough and tender. Bookmark the permalink. That said, I still crave apparel options that are fit for women as opposed to being “unisex” and actually not fitting many women well at all. Thanks again for the interview!